Implementation of GST is set to be the biggest tax reform hitherto ushered in the country. GST will be a Destination based Consumption Tax & will cover both intra State and Inter State trade & Commerce. Inter State Sales will be subjected to IGST which is combination of CGST & SGST. With the original date for its introduction in April 1, 2010, missed due to various reasons, business community is eagerly looking forward to its promised new date of April 1, 2016 & is therefore monitoring all major GST developments that are taking place under new regime. Of these developments one very important development that has happened is 122nd Constitution Amendment Bill, 2014, which has been tabled by the Central Government before the lower house of Parliament on December 19, 2014. This Bill replaces an earlier bill introduced in 2011 by the erstwhile government which had since lapsed. This Article discusses scenarios under GST regime in the light of recent developments under following 3 major headings. A. Broad Features of GST as reflected in the Constitution Amendment Bill and other announcements. Part A Broad Features of GST as reflected in the Constitution Amendment Bill and other announcements. 1. The Bill proposes to replace the current Indirect tax regime consisting of multiplicity of taxes with a single tax. At present the Constitution does not provide for any concurrent taxation powers to the Centre as well as the States for the same subject matter of tax. 2. The Constitution is therefore proposed to be amended for conferring concurrent taxing powers on the Centre & States for levying GST on every transaction of supply of goods or services or both. The GST shall replace a number of indirect taxes being levied by the Union and the State Governments and is intended to remove cascading effect of taxes and provide for a common national market for goods and services. The proposed Central and State GST will be levied on all transactions involving supply of goods and services, except for few goods which are kept out of the purview of the GST. Once the new tax system comes into place, there will be three indirect taxes namely Central GST (CGST), State GST (SGST) and Integrated GST (IGST) apart from the customs duty which is levied only on imported goods. A. Subsuming of various Central indirect taxes and levies such as Central Excise Duty, Additional Excise Duties, Excise Duty levied under the Medicinal and Toilet Preparations (Excise Duties) Act, 1955, Service Tax, Additional Customs Duty commonly known as Countervailing Duty, Special Additional Duty of Customs, and Central Surcharges and Cesses so far as they relate to the supply of goods and services. B. Subsuming of State Value Added Tax/Sales Tax, Entertainment Tax (other than the tax levied by the local bodies), Central Sales Tax (levied by the Centre and collected by the States), Octroi and Entry tax, Purchase Tax, Luxury tax, Taxes on lottery, betting and gambling; and State cesses and surcharges in so far as they relate to supply of goods and services. D. Levy of Integrated GST on inter-State transactions of goods and services. In the existing system, inter-State transactions of goods are taxable under the Central Sales Tax Act, 1956 with the revenue being collected and retained by the originating State. The tax on CST purchases is not allowed as an input tax credit and hence it distorts the supply chain, cost structure and product pricing. In the existing system there is no separate levy of service tax on inter-State transactions of services since services are taxed only by the Centre through Finance Act, 1994.
i. Centre would levy IGST which would be the aggregate of CGST and SGST rates. ii. IGST would be levied on all inter-State transactions of taxable goods and services with appropriate provision for consignment or stock transfer of goods and services . iii. Inter-State dealer will pay IGST after adjusting available, IGST, CGST and SGST on his purchases. iv. The seller in State-A will pay the IGST to the Centre. v. While paying IGST the seller will adjust against available credit of IGST, CGST and SGST. vi. State Government-A will have to transfer the credit of SGST used by the seller for payment of IGST to the Centre. vii. Buyer in State-B can avail credit of the IGST charged. viii. Buyer in State-B can use the IGST to discharge output tax liability in his own State. ix. Centre has to transfer credit of IGST used for payment of SGST to State Government-B. The model broadly is based on the philosophy that if a State tax (SGST) credit has been used to pay a Central tax (IGST) then the said State will have to transfer the amount of SGST used to the Centre. Similarly, if a Central tax (IGST) credit has been used to pay a State tax (SGST) then the Centre has to transfer the amount of IGST used to the State. The entire process would be facilitated through a clearing house mechanism. Every State would be both selling and purchasing State and therefore there would be netting of funds through the clearing house. The input tax credit chain is uninterrupted and the buyer in another State is in a position to avail credit of the IGST charged by the seller in one State. The possibility of unutilized credit in a seller State is minimized since the seller would have used the credits available to pay the IGST. G. Coverage of all goods and services, except alcoholic liquor for human consumption, under GST. In case of petroleum and petroleum products, it has been provided that these goods shall not be subject to the levy of GST till a date notified on the recommendation of the GST Council. I. Creation of GST Council to examine issues relating to GST and make recommendations to the Union and the States on parameters like rates, exemption list and threshold limits. The Council shall function under the Chairmanship of the Union Finance Minister and will have the Union Minister of State in charge of Revenue or Finance as member, along with the Minister in-charge of Finance or Taxation or any other Minister nominated by each State Government. It is further provided that every decision of the Council shall be taken by a majority of not less than three-fourths of the weighted votes of the members present wherein the vote of the Central Government shall have a weightage of one-third of the total votes cast, and the votes of all the State Governments taken together shall have a weightage of two-thirds of the total votes cast in that meeting. Accordingly Article 246A provides as follows. Notwithstanding anything contained in articles 246 and 254, Parliament, and. subject to clause (2), the Legislature of every State, have power to make laws with respect to GST imposed by the Union or by such state. Parliament has exclusive power to make laws with respect to GST where the supply of goods, or of services, or both takes place in the course of inter-State trade or commerce. Article 269 facilitates levy and collection of interstate tax on sale and consignment of goods for being assigned to States. Now a separate article 269A has been inserted to apportion such taxes levied on both goods and services. Goods and service tax on supplies in course of inter-state trade or commerce shall be levied and collected by government of India and such tax shall be apportioned between the Union and states in the manner as may be provided by the parliament by law on recommendations of goods and service tax council. Explanation: – For the purpose of this clause, supply of goods, or of services, or both in course of import into the territory of India shall be deemed to be supply of goods or of services or both in course of inter-state trade or commerce. It may be noted that IGST will be levied and collected by the Centre and proceeds of IGST will be shared amongst the Centre and the States. Thus, import of goods will attract BCD and IGST. It may be noted that import of services, as against service tax at present, in GST regime, will attract IGST. Through these definitions every commercial transaction is sought to be covered under GST by including under the terms Service anything other than goods. “Goods and Service Tax ” means any tax on supply of goods, or services or both except taxes on the supply of the alcoholic liquor for human consumption. Thus, all supply of goods or services or both will attract CGST (to be levied by Centre) and SGST (to be levied by State). As GST will be applicable on ‘supply’ the erstwhile taxable events such as ‘manufacture’, ‘sale’, ‘provision of services’ etc. will lose their relevance. It may be noted that the term ‘supply’ is not defined or elaborated or qualified (such as supply for a consideration). Thus, it needs to be seen whether even free supply will attract GST. Existing entry 84 levies excise duty all goods manufactured or produced in India except alcoholic liquors & drugs. Taxes on the sale or purchase of newspapers and on advertisements published therein. With this amendment now tax on services and newspaper advertisements is removed from exclusive domain of Centre so that it is now alos available to the States. Taxes on the entry of goods into a local area for consumption, use or sale therein. With this amendment now State VAT will be applicable only on local sales of petroleum products and alcohol. 62. Taxes on entertainments and amusements to the extent levied and collected by a Panchayat or a Municipality or a Regional Council or a District Council.”. Bill needs to be approved by a two-third majority of the house. After this, it needs to be endorsed by at least half of the State Assemblies (15). Then the Centre will introduce separate legislation for GST. States, too, will be required to bring in legislations. GST is going to be a destination based consumption tax. Place of supply of goods or services or both will therefore be very important element of taxable event under GST. In case of CGST tax revenue will go to Central Government and barring exports issues of Situs of Sale will not become very critical. However determination of Situs of Sale will be crucial for identification of State Government to which IGST & SGST on a particular sale transaction should be paid. Provisions of Place of Provision of Service Rules 2012 can be borrowed for determination for place of supply of service and with certain modifications can be applied for goods also. Consideration of current CST law provisions under Sections 3,4 & 5 can also be very important guiding factor in determination of place of supply for goods. Today a sizeable portion of transactions relating to goods and services take place through e-commerce. The policy makers will have to study taxability of these transactions critically and then frame the rules on this matter, taking care of all the foreseeable issues. Centre and the States will have to each legislate, levy and administer the Central GST and State GST, separately. Major reorganization of current tax administration will be required to be undertaken for this purpose. Credit of Input CGST, SGST & IGST will be available throughout the logistics chain for supply of goods and services with no distinction between Intra State and Inter State Trade and this will provide significant additional credits currently missed out on purchases from and by traders. This is going to be the single most important contributor to creation of common nation wide market for goods and services that will finally result in significant GDP growth for the economy as a whole. With unified GST, major issues concerning levy of both service tax and VAT on the same transactions, leading to double taxation, would get solved. However transaction will get taxed twice, once under CGST & then under SGST. Thus sale of software licenses would continue to get levied under the CGST as well as, under the, SGST . There will be an explosion in the number of tax payers under GST. As per a preliminary estimate, the number on Central side should go up to something like 30 Lakhs as against one lakh Central Excise assesses and seven to eight lakhs active assessees on the Service Tax side. Substantially more increases can be expected on SGST front, with addition of service providers who are presently out of VAT administration. The main task before the government before actual GST roll-out will be to computerise the commercial tax departments in all states. It’s because there are intricate linkages between the central government and the state governments under a GST regime. If one level is not correlated with the other, then there will be a break in linkage and data flow and that will affect GST computation. According to the IT strategy for GST reporting, there has been a consensus on a common portal providing three core services — registration, returns and payments. GST will be a dual tax, with both the central and state component levied on the same base. The integrated GST framework will be used for goods and services exported across state boundaries. Thus, all goods and services, barring a few exceptions, would be brought into the GST base. Government has set up a special purpose vehicle named as Goods and Services Tax Network (GSTN) to provide information technology support to various stakeholders under the proposed GST. This network will bring together taxation data from the Centre and states that was so far processed separately. The GSTN is already in place as a private limited company. This body will control all new indirect tax data from the Centre and states and will have access to past data as well. The charges it will impose for processing this data will be the revenue that sustains its operations. It is assured that the GST Net would merely facilitate tax-payers services in an integrated manner while the core and statutory functions of the taxmen would remain intact. Biggest task of this Network is going to be seamless management of clearing house work in respect of huge IGST transactions. Demat Model as in case of TDS will be implemented whereby a seller would file his returns with the details of GST collected from each of buyer electronically and the buyer would avail the said credit against his liability payable. CGST will start from the manufacturer and go through the first stage dealer, the second stage dealer right up to the retail level. The State governments will be taxing the services which was hitherto in the excusive domain of the Central Government. Expected GST rate is 24% of value(to be equally divided between CGST & SGST). Standard rate for CGST & SGST each is likely to be 12 per cent and will apply to a majority of the goods. GST will lower the tax rate but will broaden the tax base. Exemptions and concessions will be minimized. It will reduce distortions by completely switching to the destination principle. It will foster a common market across the country and reduce compliance costs. No cross credits between the two variations of GST, will be allowed meaning that credit of CGST cannot be availed against liability of SGST and vice-versa, except for IGST. In respect of import of goods into India, the CGST and IGST paid to be availed as credit based on destination principle. Each taxpayer to be allotted a PAN linked taxpayer identification number (TIN). This would be in line with the existing PAN based system for Income Tax and facilitate tax payers data exchange and tax payer compliance. All inter-State dealers to be e-registered and would have to communicate through emails. Separate returns to be filed for CGST and SGST. However, it is envisaged that the return formats would be common to the extent practicable. Refund of unutilized CGST and SGST to be completed in a time bound manner. The procedures and timeline are yet to be clarified. The functions of assessment, enforcement, scrutiny and audit would be undertaken by the authority collecting the tax with information sharing between Centre and States. A comparison of the applicability of GST vis-à-vis the current scheme of taxation is provided hereunder. With such a paradigm shift in Indirect Taxation, business enterprises have to take a close look at their business models today. They need to quantify how their vertical and/or horizontal integration needs will be influenced in the new regime. 1. Change in Taxable Value from present. It is learnt that both CGST & SGST will be levied on same tax base. It appears therefore that both will be charged on same taxable value. This will be substantially different from present scheme of taxation where Central Taxes are charged first on the basic value of goods and State taxes are charged on a value which includes basic value and central taxes charged already. When both CGST & SGST will be charged on same taxable amount, total taxes paid can get reduced substantially. Since GST will be based on VAT principles, credits will be available for input GST paid against Output GST, and impact on profitability will be insignificant. Though tax base will broaden under GST and dual taxes will be payable, since tax credits will be available to all players in B2B part of the market chain, decreases are anticipated for industrial goods in terms of the final prices for the consumers. For the sake of simplicity it is assumed that market chain consists of manufacturer and only one distributor and goods are consumed by buyer after the stage of second seller itself. In real life conditions where there are long market chains, impact of dual taxation can get felt in the prices to final consumer. Rate % Amt Rs. Rate % Amt Rs. Increases are anticipated on the prices of services proper, offered in B2C segment, because combined rate of GST (CGST+SGST) is on a higher level than rate of service tax charged at present. Credit of Input CGST will be available throughout the logistics chain for supply of goods and will provide significant additional credits currently missed out on purchases from traders, who are not registered under Excise. Service tax on SGST will now be available for set off against SGST on goods. Big relief thus will be available to traders who do not get any credit for service tax paid by them on input services. Under GST one can completely break up every stage of production into a separate company and there would be practically no impact on the total taxes one pays. Outsourcing of production processes or entire production activity if otherwise feasible can be profitably undertaken because make or buy decisions will not be influenced by tax considerations. Economies of scale and Advantages of Division of Labour thus can be obtained on a larger scale than under present tax regime. Commerce & Industry can now concentrate on efficiency and can do only that in which it is best fitted. No business unit will be tax driven to do those things forcefully in which it is inefficient. 6. Unutilized Credits of Input Excise, Service Tax & VAT at cutoff date. It can be expected that transition provisions will take care of Carry forward of accumulated cenvat credit and VAT credit remaining unutilized on GST effective date. Loss of this credit is not likely to happen. A small manufacturer ‘X’ has taxable turnover below Rs 10 Lakhs, medium dealer ‘Y’ has taxable turnover below Rs 50 Lakhs and large dealer ‘Z’ has taxable turnover above Rs 150 Lakhs. If X directly sells goods to consumer, his goods will not suffer any GST, but if he sell to Y, his same goods will suffer SGST and if sells to Z, his same goods will suffer CGST as well as SGST. Same goods manufactured by X will have different tax treatment. One option would be impose IGST even for such transactions since that would facilitate a seamless credit mechanism. However, the discussion paper refers to GST on transactions of goods and services for consideration. The other option would be to zero rate stock transfers instead of exempting the same. 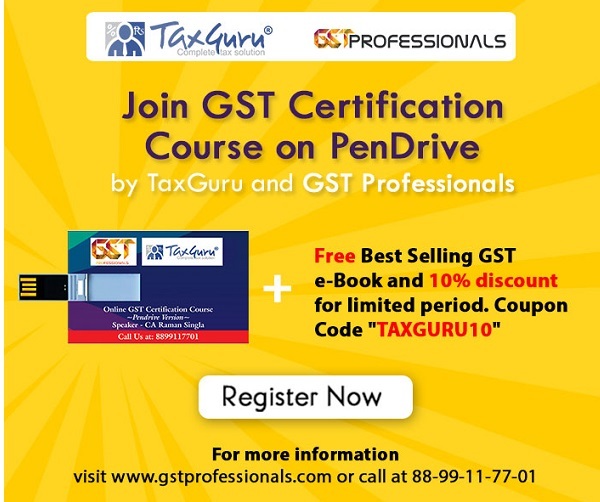 Your article entitled “Roadmap to Goods & Service Tax (GST) explains the intricate and complicate provisions of the Act in a very easily understandable manner with Practical Simplified Illustrations and Tables. It is really useful and very helpful. A Business Enterprise importing goods to India and not a manufacturing unit. As Importer, one has to pay Basic Customs Duty. Only in case of Manufacture, CGST and SGST will be applicable. After Importing, Trading Activity will be carried on. Basic Customs Duty will be paid. In the Chart, it has been shown that besides payment of Basic Customs Duty, CGST and SGST also to be paid. Is there any necessity to pay CGST and SGST in case of Importer ? Kindly clarify the above query and explain the legal position in this aspect. Beatifully compiled and it very much useful for dealers and practitioners. Can u please forward the tax impact on works contract under GST regime where the materials are sourced from outside states as well as out side country. Very well compiled and authored. A very good article -with ‘useful’ information in a very illustrative & detailed manner, with ‘simplest’ expamples.